The cool and crazy CrossFit community continues to grow as so do the number of people wondering what the buzz is all about. So, if you’re wondering why all the craze, or you find yourself wondering what exactly is CrossFit, then look no further. We have your answers here! The CrossFit.com website defines CrossFit as, “constantly varied functional movements performed at high intensity.” All CrossFit workouts are based on functional movements that incorporate movements you’ll likely need to do in some capacity through every phase of life, like squatting, dead-lifting, gymnastics movements and more. It has become all the craze in recent years as people have realized that being able to move functionally is a key component to putting off the nursing home. The high intensity portion of CrossFit is designed to give you cardiovascular endurance, increased strength, and a more supportive structure. CrossFit has an unprecedented culture that unifies people within their gyms creating an almost family-like atmosphere. As an example, the premier gym in Dana Point, CA, CrossFit Dana Point, has a rock-solid group of about 100 members who share not only workouts together, but also birthdays, cookouts and other celebrations. The CrossFit environment is not only constantly varied, but it is also constantly, very uplifting. Everyone cheers for everyone during workouts and it’s the only place that I know of where the person finishing workouts last has the loudest cheering section. This type of encouragement during a workout, regardless of your skill or fitness level, is truly unparalleled anywhere else in any other gym. Many CrossFit gyms offer something for anyone of any age and some have members well into their 50s. They even offer CrossFit Kids classes, which teach proper movement patterns and encourage healthy activity from an early age in a safe environment. Alright, I’ve Started CrossFit, How Can I Optimize My Performance? CrossFit gyms offer a structured nutritional program to enhance results and teach healthy eating and lifestyle habits. This program will help you focus on fueling your body properly so that you have the energy to perform both in the gym, while spending time with loved ones, and while at work producing results. In addition to exercise and diet, keeping your nervous system clear from interference is a safe bet to keep you moving and recovering properly. When you eat a healthy diet, your nervous system coordinates the digestion and absorption of nutrients into your blood stream, building every cell in your body healthy and strong. 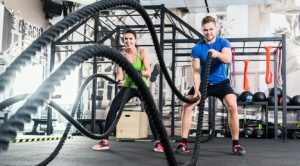 The nervous system controls how your body recovers after a workout, and how well your body absorbs those healthy nutrients; a healthy nervous system is essential so that these nutrients are available for better workouts and recovery post-workout. Having an optimized nervous system allows for better coordination, better balance, and more strength – increasing your potential to set PR’s (Personal Records) time and time again. Optimizing your body’s nervous system with Chiropractic Lifestyle Care at the core of your already healthy lifestyle is of utmost importance. Schedule an appointment for your family today.